Magnic Light: Get New Energy! The first compact contactless bicycle dynamo. Maximal light with minimal effort. No friction, no batteries, no cables. Light & Cool! 483 backers pledged $76,340 to help bring this project to life. Magnic Light is real ! Magnic Light is the first compact contactless bicycle dynamo - a new invention which we believe has the potential to revolutionize bicycle illlumination. Magnic Light is so powerful and looks so magic at first glance that most people search for a trick behind. They can't believe a dynamo can produce electric energy without touching the wheels. There are some on the market but they need magnets attached to the wheels and they don't produce constant bright light. The Magnic Light dynamo does not need any magnets attached to the wheels and it produces enough energy for a brilliant light comparable to the best hub dynamos available, while beating the efficiency of hub dynamos by a wide margin. This means Magnic Light has the comfort of a strong battery light (lightweight, no cables, no friction and hence nearly no decelaration, no noise) without needing batteries any more! The Final Countdown- Less than one week for our project! Last Wednesday I started at 5:00 AM at home and drove to Frankfurt Airport, started at 10:40 in Frankfurt - 12 hours later in Taipei at local time 6:00 AM at 8:00 Am at the hotel - at 9:00 at the Taipei Cycle until 18:00 PM. Two more days at the Taipei Cycle on Friday and on Saturday and back to Germany on Sunday evening.This was hard but is was more successful than I ever expected. Although nearly noone knew I would be at the Taipei Cycle nearly everybody passing the TIMAC booth- a distributor from Taiwan where I got a bike and some place to demonstrate Magnic Light- stopped and watched the strange lights. I didn't count but it felt like it was several hundred times I let a ball magnet run down an alumnium rack with slow speed to explain the physics behind Magnic Light. And it seemed more and more people where coming and even more and more large companies and distributors among them. First people stopped accidentally but with the passing of time they seemed to come targeted and even more on Friday. Then someone told me, that in his eyes Magnic Light would be the main innovation of the Taipei Cycle which felt like a nice but exaggerated compliment- but then I heard this again and again. So, true or not this is at least very encouraging and when the Kickstarter project passed the 100% after the first day in Taipei it felt really great! But what does this all mean for our Kickstarter project? You - the backers of this project are responsible for our success, because you have trusted us while many people outside in the web thought this project was just a joke. From now on the bicycle market is keen on Magnic Light and maybe close on our heels. So it is clear we don't want to stop after delivering the Kickstarter version to you but go on since the potential is amazingly high. This means we will invest more money in the development and your Kickstarter version will draw profit from this, while it will still remain unique (carbon version) and much cheaper than versions that will follow (because on Kickstarter we can deliver without distributors and dealers in between). 1 We will give our best that Magnic Light will be a fair business. Companies thinking about a copy should notice that cooperation may be more successful because otherwise point 1 can't be applied on them. The weather forecast is fine so we'll start our Magnic Night (200 km long distance test to the Netherlands and back) on Wednesday, March 14th at 21:00 PM. And- can anyone tell the Kickstarter people that they might consider putting us on their start page only one time and only for 5 minutes to make a screenshot? - because this may be the first time a relevant technical innovation starts its way on their wonderful platform;-) I would love to print a poster but only if it's real. For all those who still can't believe this really works: Visit us during the period of this Kickstarter project on the fair trade "FAHRRAD" (=bicycle) in Essen/Germany at booth 339, hall 9 from 24th to 26th february 2012 or watch out for reports about this event. 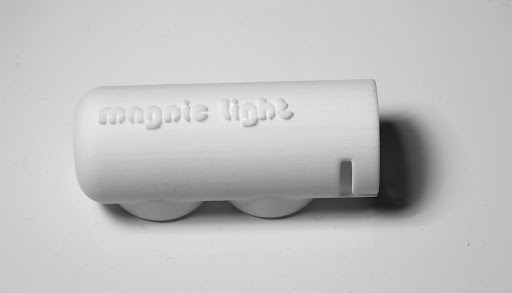 Magnic Light works with all kinds of metallic rims (normally aluminum, steel or magnesium). While aluminium and magnesium are not magnetic (but paramagnetic) they are conductive. Relative movements of magnets and neighboured conductive material induce eddy currents in the conductive material - in our case the metallic rim. These eddy currents have their own magnetic fields (see Wikipedia) which are absorbed by the Magnic Light generator kernel and by this way produce electric energy. Although there is no friction the absorption of magnetic fields has a minimal braking effect, so we don't get energy for free. Magnic Light contains the most efficient LEDs currently available (CREE XM-L T6) to get maximal light from minimal energy. For the production of a first series of Magnic Light we need expensive shapes for injection molding of the generator kernel. Other parts like high quality LEDs, strong magnets, carbon tubes and electronic parts are too costly if we order only a few. And we need machines to reduce handwork and to produce Magnic Light at a reasonable price. Last year we started with handmade prototypes and now we design our models by CAD programs and get single pieces via 3D printing services but we still don't have shapes for batch production. And here Kickstarter comes in. Kickstarter is a crowdsource funding platform that helps fund creative projects. If the funding goal is reached, the project creator receives the funds pledged by everyone and delivers the promised rewards. If the goal is NOT reached, no funds are received and backers are not charged. Payment works via Amazon Payments and backers may change or cancel the choosen reward before project termination without consequences. Just try out here on the right side, it is really simple. 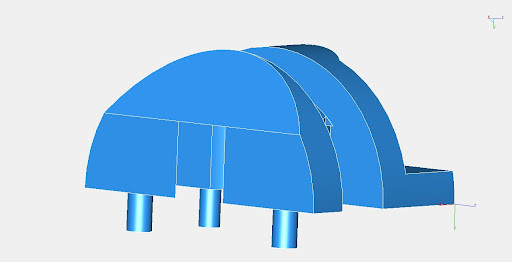 If we get 50.000 US$ we are able to pay the injection molding shapes and to order the pieces required for 400 Magnic Light sets enabling us to offer one Magnic Light set for less than 200 US$ to you. So if you want this project to become real please back us and tell all your friends about this fascinating new technique here on Kickstarter! You have the the potential to spread the word and tell the world about Magnic Light. With your help we will give our best to return a high quality product to you. We offer different rewards at different levels and also the 1 US$ backers bring us closer to our funding goal. Most of the rewards are combinations of front light and back light and just differ in quantities. The standard Magnic Light version comes with an adapter for classical side pull brakes used for most racing bikes (like Shimano 105, Ultegra, Dura Ace and similar models). Only for this adapter you get the brake light effect shown in the video! For the majority of bikes we have adapters mounted on the brake bosses of classical Cantilever brakes (most Mountainbikes, ATBs and Citybikes and also children bikes have them). If you want to use these please let us know after backing the project. For special forks or steady states without brake bosses you have to use our tube clamps which can be mounted on (nearly) every bike and which won't hurt your frame. Please tell us the perimeter of your fork respectively the perimeter of the steady state if you need these and we will pick the right one for you. Please notice that here we still present prototypes that will be tuned up and redesigned for the first series- if we should exceed our goal significantly we will invest the overage in the design of Magnic Light for our Kickstarter backers. You should also know that this Kickstarter Magnic Light carbon version will be a unique one. We will never produce it again in this form, so you get a unique fascinating high tech product much sooner than anybody else at a price considerably lower than the normal market price (if we succeed to jump on the market). We have limited the rewards just to make sure we are able to fulfill our promises in time. 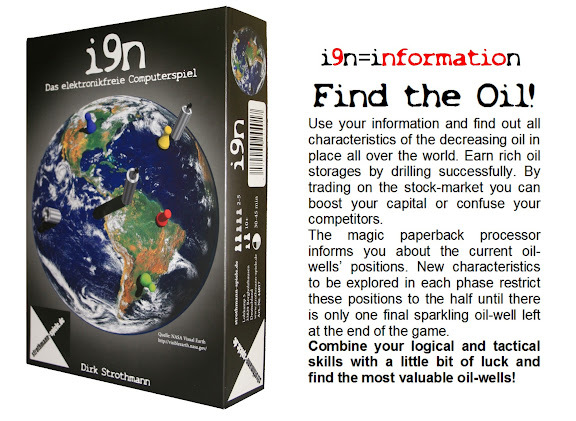 If you like the idea and want to support us but don't cycle yourself and don't need the light but like games then the unique non-electronic (computer) boardgame i9n=information (Strothmann-Spiele) invented, designed and produced by me might be fine yor you. The idea for Magnic Light was born on June 18th 2011. After a nice pasta party at home in preparation for a local 6 miles night race the next day (Die Nacht von Borgholzhausen) my brother, who is the associated electronics expert in our team, made some experiments with eddy current brakes for bicycles. Talking about the mechanism behind and especially the nice fact that aluminium rims can be used although aluminium is just paramagnetic but not magnetic we got a cool idea: If eddy current brakes work with aluminium wheels the opposite should be no problem either! Shouldn't it be possible to build a bicycle dynamo that absorbs magnetic energy from the wheels? 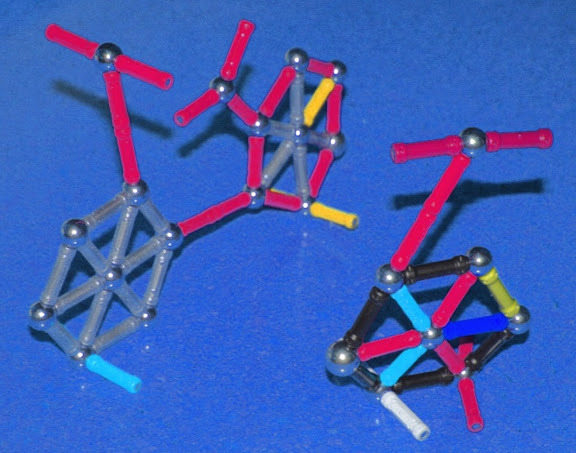 Fortunately we have masses of magnets in our house to make experiments : All those medium strong toy magnets of the children that can be used to build nice magnetic creatures. These were strong enough to make some encouraging experiments. We found out that eddy currents which are induced in the wheels have magnetic fields which can be absorped to produce electricity! While still far away from from producing electric energy we had an idea how to go on. Everybody can check that no "witchcraft" is necessary. Let a ball-magnet (you can get them in many to toy shops) roll in an aluminum pan or on an aluminium plate. The ball will not really roll (although it should) because it sticks to the aluminium surface. What happens here is caused by a simple well known electromagnetic effect: Since aluminium is conductive, eddy currents are induced in the aluminium surface when the ball moves relative to the pan. These induced currents have themselves magnetic fields so the aluminum pan becomes magnetic for a moment and holds the ball. You can find many similar experiments using this effect in literature or on the web. After ordering hundreds of power-magnets and dozens of highest level LED lights our prototypes became smaller, lighter and more and more powerful with each version. And in november we tested the first carbon prototypes: A front light of 150 g emits 150 lumen at ~16 mph. This is not bad in comparison to the best bicycle lights on the market And it becomes better when you imagine that you never have to change or load batteries any more! Not to forget that there is no friction, hence minimal deceleration and there are no external cables since everything is in one compact tube. Does Magnic Light need batteries? No, the Magnic Light system contains a magnet driven dynamo which needs no batteries. Does it work with aluminium wheels? Yes, Magnic Light works with all standard wheels except full carbon wheels and it works with all bicycle types. There is no limit on wheel size, so you can use the same system for small children bikes as well as for MTBs, ATBs, road and race bikes. Does it work under heavy conditions like snow, rain or dirt?Yes. One big advantage over common systems is that the system is encapsulated in one box without any cables and without any place to open it. This means it is really easy to make it completely water proof. There is an air gap of more than 5mm to the wheel, so there is no problem with snow or dirt, that cause problems with many old fashoined side-runner dynamos. Do I have to attach some add-ons to the wheel?No, Magnic Light consists of one single block attached at the brakes or the fork without any add-ons. Is it a kind of perpetuum mobile, because it costs no energy?No, Magnic Light is no witchcraft and hence the dynamo has a small brake effect. It takes a little bit of energy from the wheel which will slow down a little bit. But this is much less than existing dynamo systems do. So you have the feeling it works without slowing you down and due to the air gap between wheel and MagnicLight it also looks like no energy would be consumed. Does Magnic Light have a steady light function?The actual version does not have this function. However it may be integrated if many like this and support the idea. Do you have a version with LEDs in the classic position above the tire?Yes, but it has the drawback that external cables are needed to connect LEDs and generator. Can I use only the dynamo?This is possible as soon as we decide to produce it. Actually we are focused on this Kickstarter version which comes as a complete box with integrated light. Is some kind of periodic maintenance required?No- just install the light in a minute and go on cycling. Life expectancy of the LEDs is more than 10000 hours, and the magnets will last for a multiple. Can I adjust the range of the emitted light?Yes, you can adjust the Magnic Light horizontically. Is Magnic Light appropiate for offroad cycling?Yes, water, snow and dirt don't have negative effects- except you may have to clean from time to time. Magnic Light is designed to bear up under percussions. The Web: You will appear on the supporters list on our webpage www.magniclight.com. This reward is also included in all other rewards. The Card: Get a personal "Thank You" -postcard signed by the project leader. The Shirt: Get a personalized high quality functional shirt with the project logo and your name. The Game: You want to support us but don't cycle yourself ? 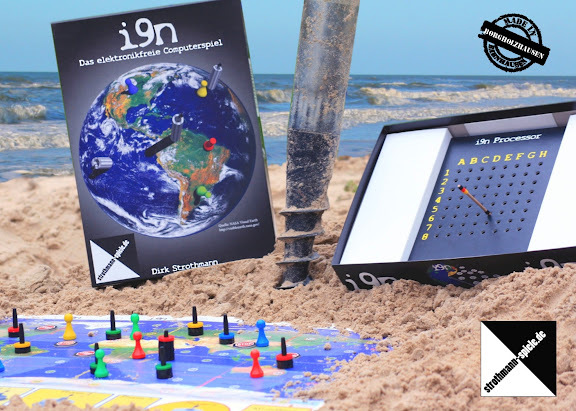 Then we have a special gift for you: Get the non-electronic computer boardgame "i9n" (www.strothmann-spiele.de) signed by game-inventor and Magnic Light project leader Dirk Strothmann in a special Magnic Light edition. For international shipping (outside United States, Germany and Netherlands) please add US$ 20. The Back Light: Get the back light of the Magnic Light system with break light function. The back light comes with an adapter for standard side pull brakes (For Cantilever brake bosses please send us a message). For a special steady state adapter (for bikes without brake bosses) please add 10 US$ and tell us the steady state perimeter. For international shipping (outside United States, Germany and Netherlands) please add US$ 20. The Front Light: Get the front light of the Magnic Light system. The front light comes with an adapter for standard side pull brakes (For Cantilever brake bosses please send us a message). For a special steady state adapter (for bikes without brake bosses) please add 10 US$ and tell us the steady state perimeter. For international shipping (outside United States, Germany and Netherlands) please add US$ 20. The Double Back Light: Get two back lights of the Magnic Light system with break light function. The back lights come with adapter for standard side pull brakes and can be mounted on the left an on the right side (For Cantilever brake bosses please send us a message). For two special steady state adapters (for bikes without brake bosses) please add 20 US$ and tell us the steady state perimeter. For international shipping (outside United States, Germany and Netherlands) please add US$ 20. The Complete: Get the complete Magnic Light system consisting of front light and back light. Front light and back light come with adapters for standard standard side pull brakes (For Cantilever brake bosses please send us a message). For a special fork adapter + steady state adapter (for bikes without brake bosses) please add 20 US$ and tell us fork and steady state perimeter. For international shipping (outside United States, Germany and Netherlands) please add US$ 20. The Early Bird: Get the early version of the complete Magnic Light system in July consisting of front light and back light. Front-light and back-light come with adapters for standard standard side pull brakes (For Cantilever brake bosses please send us a message). For a special fork adapter + steady state adapter (for bikes without brake bosses) please add 20 US$ and tell us fork and steady state perimeter. For international shipping (outside United States, Germany and Netherlands) please add US$ 20. The Double Front: Get two front lights of the Magnic Light system (can be used left/right). The front lights come with adapters for standard side pull brakes (For Cantilever brake bosses please send us a message). For special fork adapters (for bikes without brake bosses) please add US$ 20 and tell us the fork perimeter. For international shipping (outside United States, Germany and Netherlands) please add US$ 20. The Double: Get the double version consisting of two front lights and two back lights. Give one set to your partner or keep them all yourself and double your light. adapters for standard standard side pull brakes (For Cantilever brake bosses please send us a message). For 2 special fork adapters + 2 steady state adapters (for bikes without brake bosses) please add 30 US$ and tell us fork and steady state perimeters. For international shipping (outside United States, Germany and Netherlands) please add US$ 20. The Quattro: Get the quattro family or team version consisting of 4 front lights and 4 back lights. For 4 special fork adapters + 4 steady state adapters (for bikes without brake bosses) please add 50 US$ and tell us fork and steady state perimeters. For international shipping (outside United States, Germany and Netherlands) please add US$ 20.